Mr Sewjo is continuing his steady march through my sewing room at quite a pace, and today I managed to complete another project. A friend of mines little boy adores tractors, he's 4, and all the signs are he will be a farmer, he's obsessed. 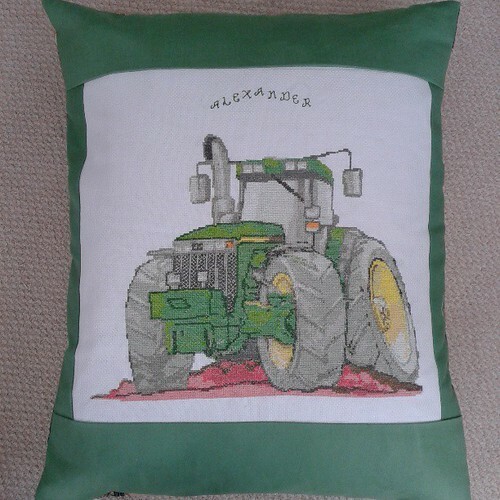 His grandmother made a cross stitch for him, of a tractor, and rather than put it in a frame on the wall, his mum wanted it to be a cushion for his bedroom. I agreed to do it for her despite the ugly tracor fabric, as she's been a great friend to me this year, putting me up when I was temporarily homeless, helping me out with childcare, etc etc. I hope they like it, we'll find out on Friday! I used a fabulous tutorial from Svetlana at Sotak Handmade for the concealed zip, and I was thoroughly impressed that even a numptie like me fitted the zip with no issues! Moving on from novelty fabric hell to something prettier, I have also made some progress on the quilt for my friends baby, it has the binding attached, all I need to do is join the ends, and sew it down. Did you hear me people, I may even have a finish for you tomorrow, what is happening to me, I've gone mad! Beauty is in the eye of the beholder and as long as the little boy likes it, what does it matter? You're obviously on a roll here with all these finishes! I'm sure he will adore this....nothing runs like a John Deer! I bet he will love it! 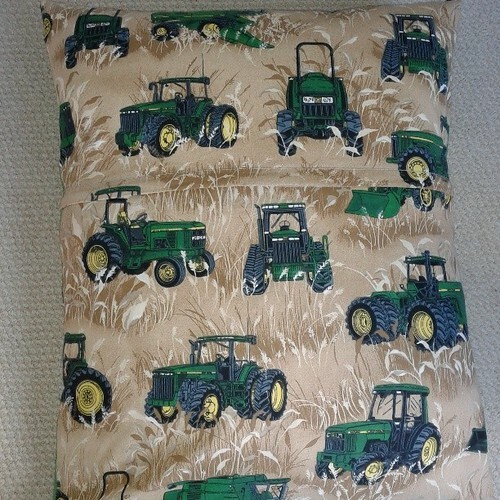 This tractor cushion is so cute. I have a 3yr old, he loves tractors too, we have quite a few John Deere models about the house! Loving the tractors! Must try out Svetlana' tutorial before the sewjo departs again. Have had it book marked for ages, thanks for reminding me!